Being part of the support team of a thru-hiker is a demanding job. It requires lots of patience and the ability to think on your feet. The role of the support team is more than just providing trail magic. Not everyone is cut out to be a support member. I have supported Ryan for a couple of long distance hikes: The Appalachian Trail in 2003 and the Wonderland Trail in 2006. 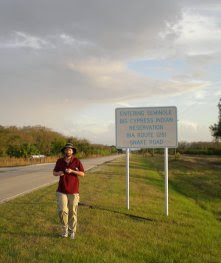 And now, the Florida Trail in 2008. 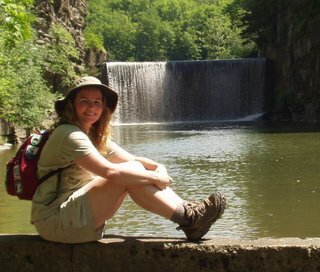 I am going to share with you the top 5 things I have learned about how to support a thru-hiker. Number One: Have a flexible schedule. The Thru-hiker has cleared his (or her) calendar and is devoting a sizable chunk of time to hiking the trail of their dreams. In order to lend support, you need to also devote a lot of time to hanging around trail towns and meeting with your hiker at remote trailheads. You will have to reinterpret trail maps to correspond with road maps in order to find these trailheads (not as easy as you might imagine.) You might not have to devote the same amount of time as the thru-hiker, but be prepared to spend a good deal of time near, if not actually on the trail. Number Three: Have comfy accommodations lined up. I made the mistake when I first met Ryan on the AT of booking a room at a Bed and Breakfast. This may sound like a fancy and luxurious choice to many of you. But to the thru-hiker, a B&B without television and with many stairs is not the ideal night spent off the trail. They want what they have been doing without for the past week. They want electricity, hot running water and television, air-conditioning (or heat depending on the season) and ice machines, large king-size beds with multiple pillows and all the rooms on a single floor (or at least an elevator available)! Basically, they want your standard Motel. No need to fancy it up. First Floor accommodations are preferred. Number Four: Clean Clothes. Thru-hikers have a uniform. They wear it every day and they only have one spare (dry in case they get wet). They have been wearing the same clothes for a week. A week without showers. So they are pretty rank. Everything they have needs to be cleaned and they will need something to wear while that is happening. I always bring Ryan a "nice" outfit that he can wear in public and not look like a homeless person. And I bring him something else he can hike in if he wants to slack-pack. He wore a nice polo shirt and slacks for stealth hiking recently. I also bring along a measurement of detergent and some dryer sheets in zip lock bags. You would not believe the number of Laundromats or Hotel laundry rooms that do not have those nifty vending machines with mini packs of detergent. And don't forget the quarters! Number Five: Patience. You will spend a lot of time waiting around, either waiting at a trailhead for the thru-hiker to appear, or waiting at home for your thru-hiker to decide where they need to see you next. If you are supporting a thru-hiker by allowing them to "slack-pack," you will need to amuse yourself while they are hiking all day. Letterboxing is a terrific way to fill up your time while your thru-hiker goes from point A to point B. Doing the thru-hiker's laundry is also another great time killer. Have a good book available or maybe a crafty project that you can do in the car, like knitting, cross-stitch or stamp carving. Research the area where you are traveling and see what other tourist sights are available to enjoy while your hiker is hiking. It makes the thru-hiker happy to know that you are enjoying yourself along the trail as much as they are. These are the top 5 things that make the life of a thru-hiker a little easier. And you have the added bonus of participating in a milestone event in the life of your hiker. Whether you are supporting someone on a 10k walk or a 2000 mile odyssey, it makes you part of the process and you can share in the glory of their accomplishment.